Sherlock Holmes has enjoyed something of a media revival over the last few years, with adaptations popping up on the silver and small screen. Robert Downey Jr brings his bags of charm in the movies, Benedict Cumberbatch stars in a pitch perfect modern day TV adaptation, and Lucy Liu somehow turns up as Dr Watson in the US version. Game wise Holmes has also had a fair share of releases, witha near constant stream of games hitting the PC and handhelds. Testament is a bit of a different take for the pixellated version of the detective, sporting a console release and higher end production values all round. 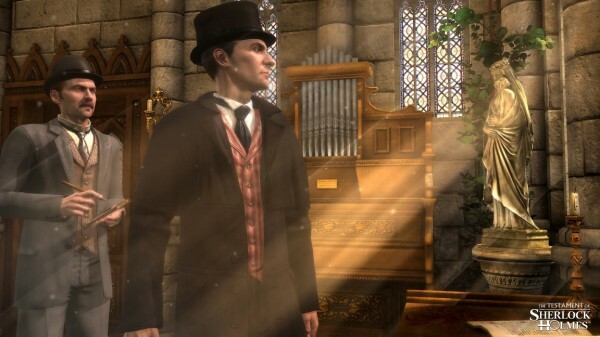 Sadly despite attempting to break a little bit bigger and badder, The Testament of Sherlock Holmes does very little to make any impact on the legacy of the character, or indeed of point and click games. Holmes goes rogue is probably the quickest way to sum up the story that has been spruiked for this game. Testament’s trailers were full of references to Holmes actually being a bit of a bad guy, and promised a tense relationship between the titular detective and Dr Watson, who would suddenly find himself struggling to cope with the possibility that his greatest friend had been lying to him for years. Unfortunately there isn’t a whole lot of the anticipated dynamic on show, with the majority of the game spent with the two enjoying a fairly normal relationship. Holmes is a bit of an arse to Watson, and Watson just takes the flack. The relationship between these two characters has always been a huge selling point for Holmes as a property, and unfortunately here it isn’t something that attracts much empathy or fondness. The main flaw is the almost total lack of humour in the script, and the rest of the game (the voice acting, the animation) doesn’t provide the best technical foundation for storytelling. The case itself kicks off with the theft of a necklace, moving into the meat of the plot with the murder of a bishop. The mystery is well paced and intriguing enough to ensure you see it through to the end, and packs in a good selection of characters and locations: Holmes and Watson take in a prison, a carnival and a morgue to name just a few. Taking Toby out for a spin is a great idea, even if its execution in gameplay terms is fairly middling. There are also some suprisingly gory and violent moments littered throughout the game, but the rest of the drama doesn’t quite give them enough impact beyond the inital surprise. 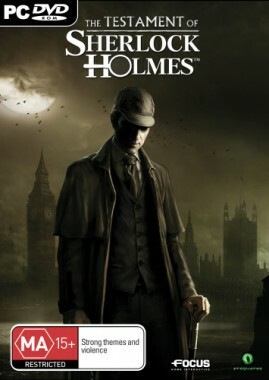 The entire game is framed by some scenes from the present day, where a group of children play in an attic full of Holmes paraphernalia. Creepy children aside the whole lot of sequences feel jarring and unnecessary. The story’s end tries to tie everything up into a nice sympathetic and heart-warming bundle, but it feels wrong for the character and leaves the series of games in an awkward place. Point and click adventures have a few simple things to get right. The control system has to allow for intuitive interaction with the world and the objects found within, and the characters have to move through it all with ease. 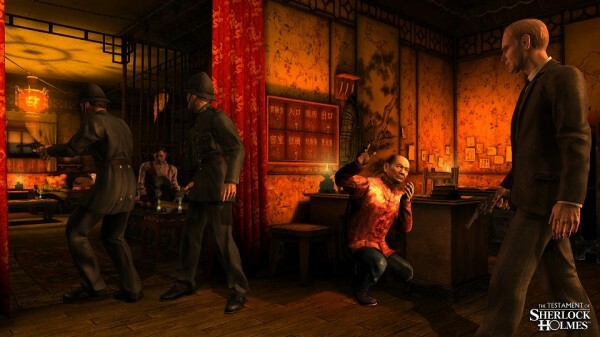 The control scheme in Sherlock is simplistic, with three different camera angles allowing players to pick between a fixed camera, third person or first person view. Movement isn’t too much of an issue (despite a generous smattering of invisible walls), but handling objects can be a bit of a clunky process. A hand or eyeglass will hover over objects that have a function, and choosing between multiple targets is performed with the scroll wheel. Inventory items are similarly cycled with a scroll, which can lead to frustration when an item you just picked up is relegated to the back of the pile. There’s also a ‘sixth sense’ function that can point out clues, although players are left to themselves to find out the finer points of the systems literal bells and whistles. Some of the major puzzles will also pop up with a ‘skip this’ button after a few minutes of clicking away, making the game largely idiot proof. The deduction boards – where players must piece together clues to form the likely conclusion – are a great feature that sadly features too little in the game, with only three popping up throughout the entire case. It’s a shame that more aren’t included as they feel like the closest thing to mimicing Sherlock’s thought process – as opposed to solving puzzles that whilst interesting have little to do with the character. The puzzles stand up well, and are a mixture of combining and collecting the appropriate objects and puzzling out sequences. The method of solving the aforementioned major puzzles is largely obvious, with the difficulty stemming from some trial and error in the process rather than a particularly tricky solution. Don’t expect to find anything particularly imaginative though, because as with the rest of the game Testament is strictly average. Average is the best of words to describe Testament. Everything works on a technical level, but nothing rises above competent. The game is rather lengthy for a point and click adventure but carries excruciatingly little replay value – once the story is concluded it’s highly unlikely that you’ll return. Graphically Testament is high spec for its genre and scale, but the visuals aren’t going to blow you away. The environments are highly detailed and full of nods to previous Holmes adventures, but lack the interactivity to make them feel genuine. Invisible walls strike too often, and the awkward navigation of the characters doesn’t lend itself to immersion either. The characters also do their best to undermine some pretty enough visuals, with bad lip syncing and strangely artificial movements. There are some terrifyingly rendered children to add to the mix, proving that dead video game eyes are not dead yet. The voice acting is good but terribly straight laced, and anyone who has been enjoying the current revitalisation of Holmes elsewhere in the media will probably be left cold by this portrayal. Holmes (a dead ringer for English actor Mark Strong, who coincidentally played the antagonist in the first Holmes film directed by Guy Ritchie) is upper class English, Watson is a bit more bumbling – job done. The more dramatic moments could do with a bit more vim and vigour from the performances and there are some absolute clunkers of lines in the script. Nonetheless Testament does deliver Sherlock Holmes and some moments of character, but it’s just not enough to put it into the big leagues. One particular feature that more noticeably drags the game down is the music. There is one track that plays for the majority of the game, no matter what is happening on screen. All atmosphere is utterly lost when you’ve heard the same loop of inappropriately dramatic music ten times before. Much of the problems Testament has probably won’t bother fans of the genre, but they do hold the experience back from greater heights. Point and clicks are terribly dependent on atmosphere and character, and the lacklustre music and sometimes underwhelming voice acting certainly takes away from a good visual style. Testament is a highly conventional interpretation of Holmes that takes no risks. It is by no means a bad game- the puzzles are intriguing and the story trips along nicely – but there is nothing here to truly impress. Everything works on a technical level but it’s utterly lacking in character and vitality – point and click adventures live on quirk, charm and powerful storytelling. Sadly Testament is lacking in all three. Fans of the genre will get through it for the sake of it, but in the grand scheme of the point and click world The Testament of Sherlock will quickly fade from memory.